So here in Massachusetts it’s a holiday…no, Marathon Monday is not a holiday, although it might as well be. Actually, it’s Patriot’s Day, which conveniently coincides with the Boston Marathon. So yes, it is also Marathon Monday. Some people have the day off, and the kids are all on spring break. For me it means there are certain places I can’t get to this morning as the marathon route from Hopkinton (marathon start) to Boston heads west to east and cuts me off from some of the places I shop. Not a big deal, I don’t mind the excuse to stay home. I have gone to watch the marathon a couple of times since moving here. It is inspiring, amazing, and at times silly. The first ones to go by are the wheelchair participants…now that is inspiring. People go nuts as the first wheelchair riders go by. 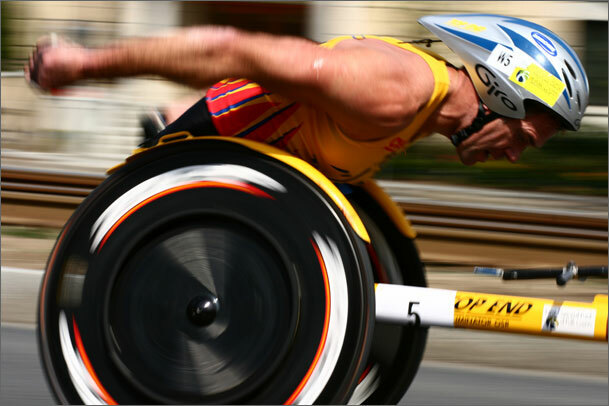 Do not think for one minute that it’s easy because they have wheels…they push themselves (literally and figuratively) for 26.2 miles. You should see their upper bodies. Makes you realize you probably complain about too many dumb little things in life. The second group to go by are obviously the elite runners..not a speck of fat on them…first the men, and not too far afterwards, the women. Last year’s Boston winner, Robert Cheruiyot of Kenya, finished in 2:05:52, a new Boston Marathon record. The first woman was Teyba Erkesso of Ethiopia in 2:26:12. Run paces, just to put it all into perspective…4:48/ mile for Cheruiyot and 5:34/mile for Erkesso. I don’t know how people do that. After the elite runners come the other thousands and thousands of runners…about 20,000 people run the Boston Marathon ~ it is a never-ending sea of people. There are all kinds…people who qualified, people who got their number through a charity organization (in turn, raising funds for said charity), a few celebrities, people running in honor of someone, people running to celebrate overcoming a challenge in life, and some people who just want some attention. I have to say, as much as I really do not like to run (I was going to say “hate to run” but sometimes I don’t mind it too much) and I have never run more than 13 miles (and I did that only once), you watch all the people running by, some suffering, some with smiles, and you think, “wow, I should do that!” Luckily, after being home for an hour or so the feeling wears off and I return to reality. I actually cannot imagine running 26.2 miles. So today my teammate David is running Boston. When I think about everyday people who are inspiring, David is one of them. Last year David trained for his first Ironman, Lake Placid (NY) in July. David is the picture of discipline. It can be very lonely training for an IM…you have to log some ridiculously long workouts. David is the kind of person who has a plan, and he actually sticks with it (which right there, is more than I can say for myself). David went to Lake Placid and had an amazing race, finishing in 10:42:14. An Ironman is a 2.4 mile swim, a 112 mile bike and a 26.2 mile run. David finished 7th in his age group (50-54), qualified for the Ironman Hawaii World Championship and qualified for the Boston Marathon…his run split, after swimming 2.4 miles and biking 112 miles, was 3:26:53, which easily qualified him to race Boston (qualifying time for men 50-54 was 3:35). So he is out there today, “only” having to run 26.2 miles. We are expecting great things from him today! GO DAVID!! Onto another inspirational friend. Yesterday was our “Tough Mudder” training workout…if you don’t know what this is all about, read my blog post from Friday. We met at 10:30 for our first run, approximately 5 miles on the road. We had 10 people show up, and went off in two groups (the slower group took off about 10 minutes before my group ~ I was waiting for my boyfriend to show up, and ended up in the faster group, which was a big mistake). We finished the run, then went over to a nearby playground where I set up a circuit that included battling ropes, the TRX, a medicine ball (which ended up cracking), hurdles, a heavy jump rope, push ups, chin ups, etc. Ten stations in all. There was some debate about how long each station should be, with one person throwing out a minute. I suggested we try 30 seconds on, 15 seconds rest/transition to the next station…good thing…by the end of the 10 stations everyone was pretty gassed. My teammate Margaret (the one who used the mind control to actually get us to all sign up for this ridiculousness) then led all of us to a small hill, which we ran up and down more times than I wanted to, then led us in walking lunges across a field. Ouch. We then did the circuit again. And THEN we went and ran about another six miles of trails. I have to admit to being the straggler on the trail run, although at that point we had lost 4 of our original participants. I couldn’t even see Margaret. Which is so friggin’ inspiring because Margaret is a breast cancer survivor. My legs were killing me about the last 3 miles of the trail run, but how can you complain, how can you stop when Margaret is up there in front? We all know people who have done amazing things, who for varying reasons inspire us to be better people, to work harder, to complain less. Who inspires you? This entry was posted in Fitness, Motivational and tagged Boston Marathon, Tough Mudder training. Bookmark the permalink.